On Wednesday, Google introduced the Chromecast, a $35 media-streaming device that some have already called a rival to the Apple TV and its AirPlay capabilities. In some ways that comparison is right. In other, more accurate ways, it’s not. Both the Chromecast and the Apple TV connect to your HDTV via HDMI and let you watch some streaming content on the big screen. But how they work isn’t really the same. 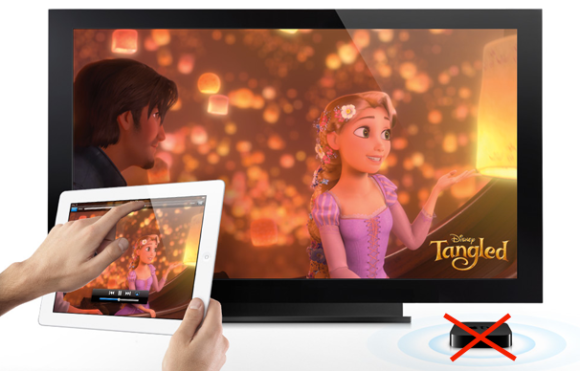 AirPlay and the Apple TV. The Apple TV offers access to content from Netflix, Hulu Plus, YouTube, HBO, and several professional sports subscriptions (to name some) as well as from Apple’s own iTunes Store. But it also lets you stream locally stored audio and video content, as well as photos, from computers in your home. And, using Apple's AirPlay media-streaming technology, you can send content directly from an iOS device or Mac to your TV through the Apple TV. The Chromecast supports Google Play, YouTube, Netflix, and Chrome content (with more promised, but what and when is a mystery) streaming over the Internet, and uses your Android or iOS device, a Mac or Windows PC using Chrome, or a Chrome OS device, as the remote control. Although you select content on your device, there’s no AirPlay-like streaming going on, no bits flowing between your tablet and your TV. Once you start something playing, you can stomp your Android phone under foot and the video will continue on its merry way. Since it can stream Internet content, the Chromecast is sort of like an Apple TV... but is much closer to Plair Media’s eponymous $99 video streaming stick. (The Plair uses a similar form factor and method of playing content, although it additionally lets you play local content on your TV. What Plair doesn’t offer, however, is Netflix support.) That’s why Google calls it casting your videos instead of streaming them, since you’re just sending over a URL—basically, telling Chromecast what video to seek out online. That’s not to say that the Chromecast doesn’t look interesting. And unlike the buggy fail of a product known as the Nexus Q, this one will actually see the light of day. At $35 (along with three free months of Netflix, bringing the actual cost down to $11.03) the Chromecast is a very inexpensive way to get Netflix on your TV. And its connections to the Google Play Store and much of what’s on the Web via Chrome may make it ideal for a certain type of customer. But putting it up against the Apple TV’s streaming powers is a false comparison, or at least premature.